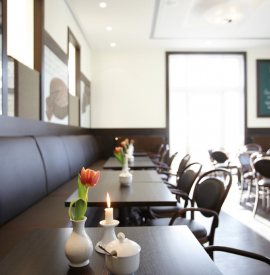 The Wiener Café Arendsee is a symbiosis of a classic coffee house with modern elements. The main focus is on authenticity and one will just want to stay in this beautiful place. How about some peaceful reading time while enjoying coffee and cake? 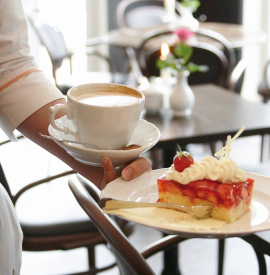 The terrace in front of the café offers a view of the promenade and the Baltic Sea - so there is plenty to observe when enjoying Pharisee or Café Crème, with delicious cakes and exquisite pies. Accurately named after a small brook which runs smoothly through the Kuehlung, the Bar Cubanze in the hotel lobby is a refreshing meeting point in the most literal sense. Whether with a delicious cocktail, an unusual whiskey or simply a refreshingly cold beer: Here you can end your evening peacefully. Enjoy the first drink at half price (except spirits). Every Wednesday from 8 pm to 9 pm.